"Mom, you just bought another load of crap from the world's fattest fertilizer salesman." So what took you guys so long? Eighteen years and hundreds of episodes into their run on Fox, Springfield's first family finally makes it to the big screen, and the feature was so long in coming that you'd have been forgiven for having forgotten that talk of it was in the works for nearly twenty years. Which makes this almost a pleasant surprise and a delightful little afterthought, in a way�it may not rise to the level of some of the funniest episodes of the series, where the strict parameters of network television force the creative staff into packing each 22-minute piece to the gills, but it's sure no fallow disappointment, either. The writers, animators and editors reward diehard fans of the show with many cameos from old pals, but you need not be completely immersed in Simpsonia to appreciate this terrifically irreverent and very funny feature film. And that's because, on some level, the whole movie is set into motion by pig doody. And really, who doesn't love a movie about pig doody? Model father Homer Simpson knows the interspecies love that dare not speak its name�he falls head over heels for a pig on a commercial shoot, and saves it from the abattoir by making it his constant companion. He just can't quit that pig, but he's got one insurmountable problem: there's no place to store the voluminous pig excrement, so Homer tries to dump it all into an already hideously polluted Lake Springfield. Wouldn't you know it, but Homer's contribution pushes the lake past the tipping point, setting off an environmental crisis�at the White House, President Schwarzenegger declares an emergency of sorts, and has all of Springfield placed under a giant glass bubble, to insulate its oozing evil from the rest of America. All the pals are here�Lisa finds an environmentally conscious new Irish boyfriend; Bart looks longingly next door at doofy Ned Flanders, who actually seems to care about his kids; Marge wants to save her family and her marriage, both in a state of crisis. You can't fault the green message of the picture, either�it's not too subtle, certainly, but makes its points, making this sort of the Colorforms version of An Inconvenient Truth. Albert Brooks makes for a smashing villain as the head of the EPA, and high marks particularly to Tom Hanks, who contributes a fantastically fatuous fake PSA. Fox has never been bashful about marketing this show, and it's one of the great ironies that this terrifically anarchic animated series is part of Rupert Murdoch's empire. It's also kind of nice that we're all in on the joke�the movie opens with the family going to see the Itchy and Scratchy movie, with Homer fulminating against the stupidity of those going out to pay for what they can get for free at home. You sort of sit and watch and think: D'oh! But it's a sharp and funny ride, and your appetite for more Simpsons can be sated easily enough thanks to the magic of DVD and syndication. Image Transfer Review: The animators have taken full advantage of the widescreen format, and the images are loaded with detail�the opportunity to fill up the frame in a manner not possible on television makes this a visually pleasing picture, even if the continuing high regard for the series doesn't stem principally from the quality of its animation. The transfer looks reasonable, though with occasional discolorations�dOc was sent only a screener disc to review, so this may not be representative of the final product. Audio Transfer Review: Many audio options, all of them reasonable choices�surf on over to the foreign-language tracks for kicks, to hear how what seems like such a singularly American phenomenon translates into other tongues. 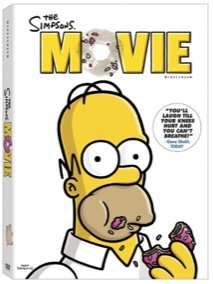 Extras Review: Two excellent commentaries pop the hood on the creative process, and there's a wealth of information here about how something like The Simpsons gets put together, along with no shortage of laughs. Listening to the first track, featuring series creator Matt Groening and executive producer James L. Brooks, is like pulling up a seat in the writers' room�they discuss the use of widescreen and the opportunities unavailable on TV, among other topics. Occasionally Brooks wants to amplify on a point and calls for the movie to stop�it obliges, so the track actually runs longer than the feature. Yeardley Smith, who provides the voice of Lisa Simpson, shows up late and asks a series of very rudimentary questions about the animation process�it's kind of stunning that she's been working on the show so long and knows so little about that side of it, but it is helpful in cluing in the rest of us. Director David Silverman appears on both tracks, and the second, on which he's joined by a couple of the movie's sequence directors, repeats some of the story development stuff of the first; as you might anticipate, this is a more technically oriented commentary, and is equally illuminating. Writer Al Jean delivers a brief introduction to a modest collection (5m:14s) of six deleted scenes, all of which are funny enough, but seem to have been cut for reasons of pacing. Under the heading Special Stuff, you'll find four very short pieces (3m:05s), including a couple of Fox cross promotions with the Simpsons appearing on American Idol, and a fantastic little riff on the dancing hot dogs that encourage us all to go to the lobby for snacks at the movies. Finally, click on the menu headings when you can�you're likely to find an Easter egg, a collection of sketches showing the development of a couple of characters created for the feature. The Simpsons' maiden voyage into feature films was a long time coming, and the result is creditable if not over-the-top brilliant, which would probably be too much to expect from a series on TV for close to twenty years, even one as good as this. The filmmakers take full advantage of the opportunity to stretch their muscles, especially technically, and the commentary tracks make this a particularly appealing release.